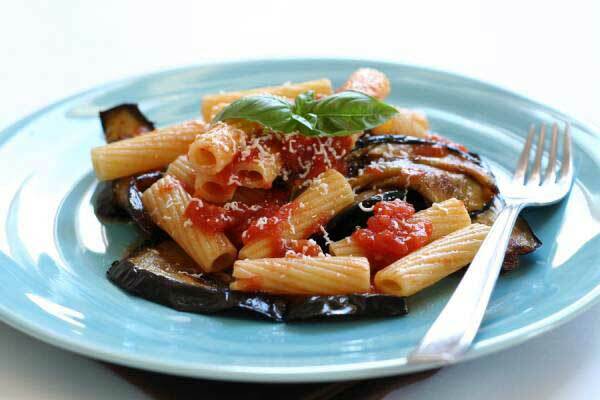 This pasta dish is a classic Sicilian dish, named after the opera by Vincenzo Bellini and made with aubergines, fresh tomatoes and is seasoned with grated ricotta cheese. Guests on our cooking holidays to Sicily love it and it really is very simple to make – so why not give it a go! Preheat the oven to 180 degrees and lay out the cherry tomatoes on a baking tray. Liberally drizzle the tomatoes with olive oil, season with sea salt and top with the sprig of thyme. When the tomatoes are nicely roasted, remove from the oven and place in a saucepan. Add the garlic and gently simmer for 20 mins. Discard the garlic from the sauce. Slice the aubergine into even sized slices and sizzle in olive oil on a medium heat. Turn the aubergine to ensure they are nicely browned all over and lay to drain on paper towels. Boil a large pot of salted water for the pasta and cook according to packet instructions until pasta is “al dente”. Add the aubergine to the tomatoes and stir. If the sauce is too thin, add a little of the pasta cooking water and a drizzle of olive oil to loosen. In a warm serving bowl mix together the pasta and tomato sauce. Top with the grated ricotta and shredded basil leaves. Season to taste with salt and pepper and enjoy! We hope you try this satisfying Sicilian recipe. For more delicious Italian recipes, check out our website. Inspired to learn more traditional Sicilian recipes? Have a look at our cooking holidays to Sicily.